Thrilled and humbled to share the Lord has called me to create A HEART FOR THE HOMELESS devotional magazine to be distributed around the country along with my other Gospel tracts, themed tracts series, devotional magazines, and books. 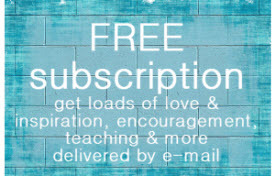 The magazine includes my Good News Daily writing online along with personalized letters & encouragement & support from my heart led by the Lord to the hearts of readers. 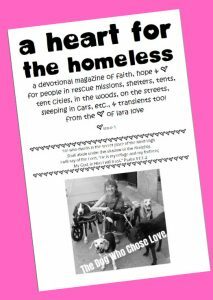 The FREE publication is available to homeless shelters, Gospel rescue missions, rescue missions, ministries and individuals serving the homeless population, street preachers, evangelists, non-profit groups, churches serving the homeless, counselors, and any and all led to love and serve those who are homeless and transient. Love, prayers, encouragement, donations & monthly sponsorship are all very welcome as I go forth with this very special project along with the other work to which the Lord has called me! Please feel free to reach out to me for more information at lara@goodnews.love or 843-338-2219.